Huh. I haven't come across this bug before. Sounds like a timing issue between picking up the bike, and the script that triggers the transformation between bike/on foot player. If you ever run into any issues with being stuck in bike mode, type "give motorcycle" into the console. Then you can press jump to get off your bike and be back on foot. I'm redoing the vehicle code anyway, so hopefully this issue won't pop up again. It does spawn a second motorcycle and for some reason suddenly boosts my armor with a hundred points but the character keeps behaving as if he is on the motorcycle. Okay, I haven't been able to replicate the bug, but if you type "puke 901" into the console, it should restore normal player movement. I'm going to keep seeing if I can get this to happen, but it sounds like just a random script mess-up. Another reason I'll be re-doing how I do this script. Sorry Vostyok, the problem persists even if I use that command (it just spawns more motorcycles). I am using gzdoom-x64-g3.7pre-766-g8b46be768, could the problem lay with it? Weird. That's the same version I was using last. The only thing I can recommend is to try running "puke 900" from the console and then pressing "jump" and see if that works. I've been going through the code to see where the problem might lie. I've know about this bug if a level change or player resurrect while in motorcycle form is in effect, but it's never been something that I couldn't fix by jumping, this automatically kills the motorcycle code. Have you checked to make sure jump is still bound to a key? Tried that command but I get the same results as Puke 901. Also rebound the jump key and the use key. I even started a new game, this time without the FAL mod but the problem persists. Okay, sorry about that. I reinstalled the version you listed and it seems to be a problem with that version of Gzdoom, as I had the same problem. Hello, this is my first time posting here! This was an amazing mod, and I had a fantastic time playing through it. The atmosphere you created was fantastic and I especially loved the level design, my favorite being the secret level! I thank you for making it, and I am looking forward to the second episode of Ashes 2063. I'm afraid not. This isn't the best time of year to be getting much work done. Ep1 is unlikely to see much in the way of updates for a while, as I'll be working on ep2 so any improvements will come from that. I've been mapping the first third of this new episode but am still early into this with regards to new sprites, textures, art and story flow. Don't expect much to see till February, sadly. On the plus side, this shouldn't take as long as the first one did. Half the work is already done. Something I noticed playing the sanitized editon: The burning barrels in level 2 have an extra frame that flickers to a different object or something. I don't think this was due to any of the mods I have loaded, though I didn't test vigorously. Also the "generator" on level 1 toggles the lights on but then they go off again. This *might* be related to using DarkDoomZ so I'll have to go back and test but figured I'd mention in the meantime until I'm able to confirm. I'll have a check when I get back. The lighting issue hasn't cropped up anywhere else, so maybe dark Doom trying to reduce it. Been replaying Episode One and Dead Man Walking a lot recently, and noticed a thing at near the end of Episode One's The City, at the start of the sideways collapsed building section that starts after the parking garage packed full of gangers. There's a place near the start of that section where you can find a dead body with some food items and ammo, but some of the items are laying in this small divot in the ground that makes them impossible to pick up. Not without a lot of patient and very slooow and gentle wiggling around for some of them, and then using 'noclip' for the rest. 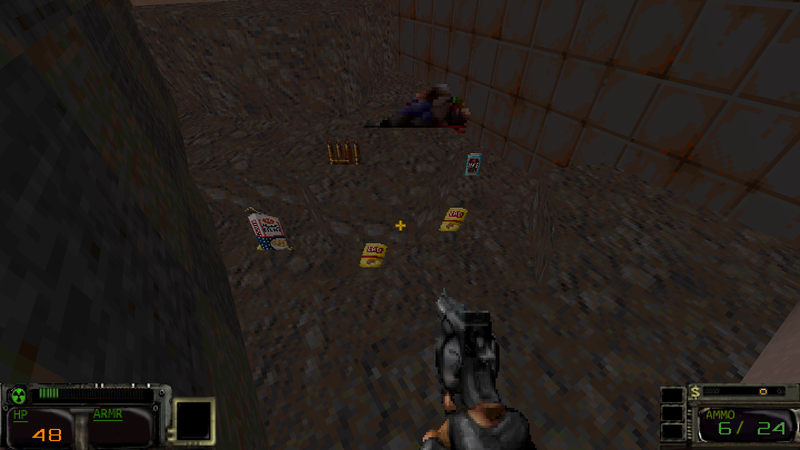 EDIT: Also, a bit disappointed I can't destroy the desiccated corpses that look very much like the ones from Hexen. They were destructible there. Yeah that was a mistake when I was moving some actors around. I'll have to fix that at some point. As for the corpses, there are a few objects (such as the fire extinguishers and empty cola cans) I also want to add some interactivity to, such as exploding or kicking them around. But I didn't have the time for the original release. I'll be adding stuff like this in at some point. Currently working on some new weapon sprites and some mapping, now that I am back from my little holiday. Stay tuned for some news, perhaps the end of this month or next month. Finally got around to play this. Impressive, astonishing work that is just so much fun to play through! Shame it hadn't won a Cacoward, but those are just opinion pieces, so whatever. I'm sure that the welcome, positive reception that this TC has got so far is more than making up for it. Once you're through that hole, there's no way you can get back to a secret level exit.